Black Friday isn’t as exciting as a couple of years ago. Sales are more common year-round, so though most retailers get involved on the big day, it seems fewer are willing to go crazy. Smaller, more niche discounts spread out over the weekend or even the week seems to be the trend. But that doesn’t mean Black Friday doesn’t matter, of course. In an effort to see who is prepared for Friday 24th November, I’ve been having a look at landing pages of 11 top UK retailers. Now, I know there’s lots more for retailers to consider than a simple landing page (such as site stability, retail strategy, contact strategy, media spend etc. etc.) but these pages offer us at least some insight into how prepared brands are from an SEO and strategy perspective. What are we looking for? It’s fairly simple – landing pages should be up early, preferably all year round to maintain search status (see our SEO analysis from 2015). These pages should be adapted as the year goes by, and they should have some useful content and email signup functionality. Spoiler alert: Game is probably the best prepared, with Argos and Selfridges two retailers who don’t seem to have got their pages in order. Dyson’s page is simple but effective, and that’s the main thing you’re looking for a month out from the day. An interesting feature of the data capture on this page (see second image below) is a checkbox system which allows the consumer to tell Dyson which product they’re interested in (corded vacuums, cordless vacuums, or fans and heaters). 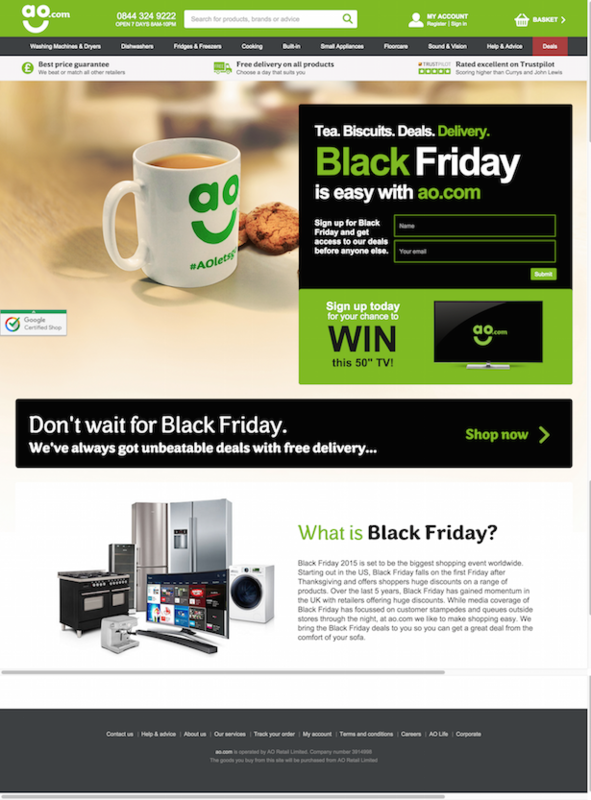 This is a smart way to make email marketing more effective in the lead up to, and on, Black Friday. There’s no keyword-packed copy about Black Friday, and that’s a good thing in my eyes. Much better simply to highlight free next-day delivery, Dyson’s price promise, product guarantees and a monthly payment option. However, Dyson’s page is pretty generic. It doesn’t contain any reference to the year, 2017 (see SERPs below). That’s not ideal but nor is it too much of a problem. It’s better than having the previous year in the title tag or description and means Dyson doesn’t have to update its page every 12 months. There’s obviously a slight downside. The consumer can’t see from the landing page what date the sale lands on (24th November). But, at least Dyson’s strong brand and narrow product range means it unlikely to lose out from an SEO point of view. Unlike Dyson, Game provides plenty of info in its title and description tags. As you can see, the search listing tells me to ‘check back on 23rd November 2017’, which is the day before Black Friday. That’s a nice bit of copy to make sure consumers are prepared and visit when Game releases its early deals. When it comes to the Game landing page, the retailer goes one better than Dyson. There’s a clear form to register your interest and Game asks for extra details such as postcode and date of birth to help with its targeting. No point in advertising an 18 certificate game to someone underage, or in-store London events and offers to someone on the Isle of Mull. Even better, Game asks the user to say whether they are a ‘dedicated gamer’, ‘generous gifter’ or ‘gamer who gifts’. These are three very clever categories which should give a rough guide as to how much money the customer may have to spend and how much knowledge they have of the product range. Those who are gifters (and not gamers) will need different content to the dedicated gamers. A note that there’s also a cheeky pre-ticked checkbox for the Game newsletter – that will have to change once the GDPR comes in next year. Further down the landing page, Game provides deals that consumers can check out in the meantime, with compelling calls to action for console and game offers. Right at the bottom of the page there’s some detail on Game rewards, trade-in, next-day delivery and the Game app. Black Friday landing pages are great places to assert just why it is that consumers should choose your retail experience. AO.com gets the same criticism that Dyson does, namely a generic search listing thanks to no mention of 2017 in the title or description tags. Yes, that means minimum upkeep but it doesn’t grab the customer like the Game example above. However, the AO.com landing page might just be my favourite because it doesn’t muck about. One big and clear call to action asking consumers to sign up now for 2017 deal alerts and another big call to action asking me ‘why wait?’ and directing me to great deals with free shipping. It doesn’t take much to do this, other retailers (coming up in the next section) should take note. It’s perhaps worth adding here that in previous years AO.com has gone further and used a prize draw on this page (to win a television) as an incentive to get people to sign up. Not so this year, perhaps the holiday is well-established enough that the retailer doesn’t need to bother. I’m a bit disappointed in Argos. It is usually such a well-prepared retailer and demonstrates best practice across ecommerce UX and media spend. But its Black Friday search listing and landing page leave a lot to be desired. The search listing is just a little lazy – while the title tag looks right, 2016 is still listed in the page description. Then when we get to the landing page it’s a mess of plain text with no imagery and an email call to action that’s very difficult to spot. This is one of the most unappealing pages I’ve seen – look at the second image below and how the white boxes with white text appear. Doesn’t exactly appeal to the consumer. Compare this 2017 landing page with that from 2015 (view it here). There’s no contest, Argos seems to have taken its eye off the ball. Very is just as frustrating as Argos. There’s more plain text, with the page appearing as though it was thrown together pretty quickly. Though there is a clear email signup button, which changes colour on rollover, the uninspiring imagery and low-res social icons don’t really set the pulse racing. What’s more, it seems this page is a template shared by other retailers in the Shop Direct Group (here it is on the Littlewoods website). Neither page actually tells me what date Black Friday falls on. In search, there’s evidence of more ill-preparedness. There’s a second Black Friday landing page, titled ‘Black Friday Week’. Click through to it (see further below) and you’ll see it’s a blank page. O2 appears not to have touched its Black Friday landing page since last November. Here you can see the title tag referring to 2016 and a description more suited to last Christmas, telling consumers Black Friday has ended but other bargains are available. The page itself is doing nothing to capture early interest, no email signup, no flagging of the date or teasers of what might be on sale come the 24th. An opportunity missed. Tesco is another transgressor in the search listings, with its landing page still having a 2016 title tag and description. At this stage, one really would expect this to be updated. The landing page itself does seem to have had at least a little bit of TLC, with the correct date and year appearing. Not bad, but must try harder in search, particularly given that the page below indicates Tesco will be running sales over the entire weekend. Currys isn’t that bad, but I’ve included it with the other guilty parties because with a little more effort and focus, the page would surely be more effective. The first problem is a fairly skinny, measly call to action to ‘register your interest’. This should be bigger and bolder, like the AO.com example. Further down the page I quite like the little pictures showing what items are likely to be discounted, which should get bargain hunters interested. But at the bottom of the page, I’m really not a fan of this keyword rich content that looks like its there simply for search benefit. That’s not what search is about nowadays – the key messages should be picked out and properly conveyed to the user in a more friendly format. When it comes to the SERPS, Currys does fine, with 2017 in its title tag, even if the description doesn’t do much for me. However, there is a slightly odd PPC ad from Currys Ireland – not sure how the targeting went wrong there, seeing as the ad itself shows that it knows I’m in Manchester. Perhaps a little finesse needed as part of the paid search targeting here. Next up is John Lewis, another retailer with a search listing that hasn’t been updated. The landing page has been updated with the correct date at least, there are links to current offers, and I like the fact that there’s an explanation of how ‘never knowingly undersold’ works, even on Black Friday. But, there’s no data capture. 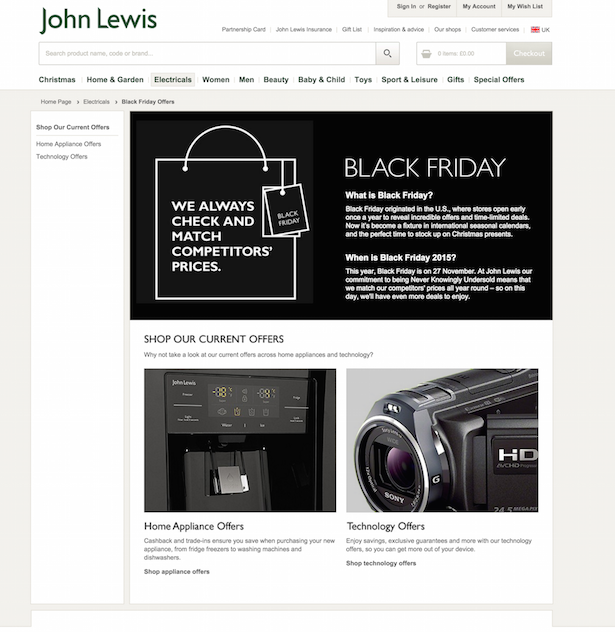 Though this page has been redesigned slightly (here it is in 2015), John Lewis needs to put more thought into revamping this page, rather than simply changing the date and the text, it needs to allow for some customer interaction. So, now to the retailers who don’t seem to have any Black Friday landing page at all. As we’ve shown previously, this is a key part of maintaining a good search ranking. A sale and reductions page is the top result for Selfridges. No mention of Black Friday. When I click through to the page, I get a page full of products and a faceted navigation. There is zero information for the user. Selfridges did take part in Black Friday in 2016 (as you can see in the Telegraph link in the SERPs above), and even if participation this year is limited to some 20%-off and 10%-off ranges, there should still be an effort to let customers know about it ahead of time. Data capture should also be considered. Another retailer that took part last year and is set to do so again this year, but has no information on its website. My search query simply serves up the Richer Sounds homepage. I tried using site search and a ‘site:’ modifier on Google, but could find no pages related to the planned 24th November sale. That’s the end of this niche roundup. Have you seen a retailer with a stellar Black Friday strategy? Let us know about it below. Want some more in-depth analysis? Read our Black Friday: Ask the Experts post. It’s proving to be a pretty good year for British retailer Ted Baker. The brand has just announced a 14% increase in half-year revenues, as well as an impressive 43.8% rise in ecommerce sales. It’s not just the UK that’s been loving Ted Baker either. Sales in the US increased 18%, while sales in Asia rose nearly 30%.